Located in the hip Bay View neighborhood – just an eight-minute drive south of downtown –you can live like luxury for a night or two in this three-bedroom, four-bath Tudor home. But you’re also a few blocks walk to bars and restaurants, and coffee roasters and cafes, too. Boasting a view of Lake Michigan, as the house overlooks the lake, this could be a nice retreat – there’s even a walking path down to the beach, which is popular with locals as a picaresque spot to stroll. This home dates back to the 1850s – and has been lovingly restored, with modern conveniences thoughtfully incorporated throughout, like an updated kitchen with a granite-countertop island and three different coffee-brew methods (drip, Moka, and French press), ideal for the coffee-geek traveler. A spiral staircase leads to the lofted master suite (there is just one bedroom here, but plenty of sleeping space due to the open layout). Pamper yourself with the Jacuzzi tub and fireplace, and don’t hesitate to bring Fido (dogs welcome). Location is key with this rental as it’s only a half-block from the Pabst Theater, where many national touring musicians perform, as well as the Riverwalk (along the Milwaukee River, and home to the Bronz Fonz) and other downtown performing-arts centers like the Marcus Center for the Performing Arts and Riverside Theater. But the loft's interior is pretty sweet, too: exposed Cream City brick (a creamy-white brick native to Milwaukee) walls and fireplace, natural sunlight, a gourmet kitchen and tall ceilings make it feel like a city retreat. Also nearby: tons of restaurants along North Milwaukee Street, from sushi to steak. Riverwest is Milwaukee’s most eccentric neighborhood, filled with artists and many cool bars, cafes, and restaurants. Just over the bridge from UW-Milwaukee, the housing styles vary – including this urban cabin. Inside is a true love for vintage, Midcentury-Modern décor, right on down to dishware in the kitchen. If it’s warm, chill out on the deck. Within a 5- to 10-minute walk of Lakefront Brewery and Brady Street (an Italian-immigrant section of the city lined with vintage-clothing shops, bakeries, ethnic restaurants and coffee houses), this modern home boasts a huge deck with Milwaukee-skyline views, an open layout, and a spiral staircase. The spacious kitchen is totally modernized with stainless-steel appliances and there’s a fireplace in one of the three bedrooms, plus a whirlpool tub in one of the baths. There are a total of eight beds in this home. Riverwest Hobbit House Upper Apt. The upper flat of this bungalow—in River West, an eclectic neighborhood with great restaurants, bars and a farmer’s market on Sundays during the warmer months—has one bedroom, lots of natural light, a Formica dining set, and a vintage bar with two bar stools, among other design-friendly details. A backyard is perfect for hanging out, thanks to a fire pit, picnic table, and hammock. 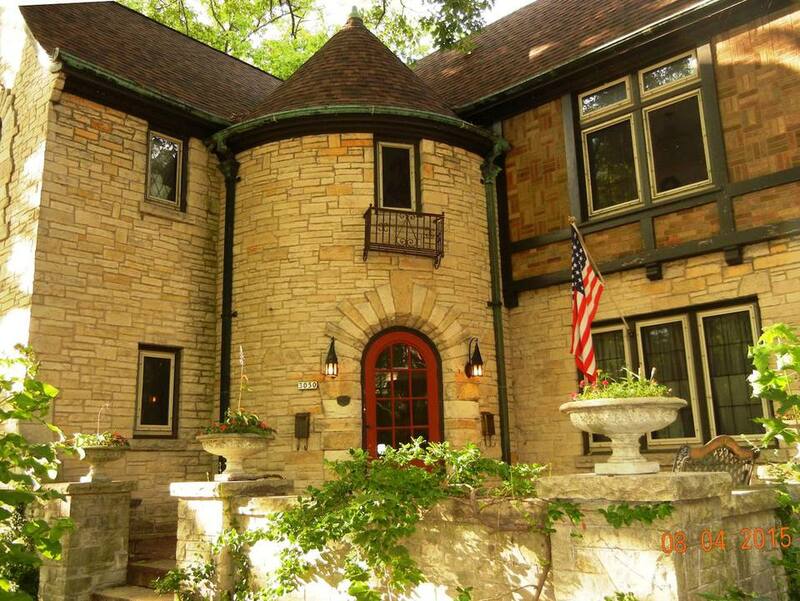 Downtown Milwaukee is a 10-minute drive from this bungalow. With goal of making this feel “at home,” there’s a private yard, porch, indoor plants, cozy-and-chic furnishings (check out the furry white pillow! ), a fireplace, and Midcentury Modern décor. If you’re planning to be at the University of Wisconsin-Milwaukee, you really can’t be any closer as the campus is one block away. Lake Michigan is close, too—a quick four-block walk. Shorewood hosts quite a few coffee shops, bakeries, restaurants and clothing boutiques, which means you never need a car.